For 1991 and 1992, GM offered the SLP Engineering "Street Legal Performance" performance kits through GM dealers. These kits were offered either as a dealer-installed option or could be installed by the customer. Each kit consisted of the following: 1) SLP Hi-Flow Aluminum Siamesed Intake Runners, 2) SLP Tri-Y Stainless Tuned Exhaust Headers, 3) SLP Low-Restriction Stainless Exhaust System, and 4) Revised Engine Cal-Pac PROM (specific to application). These kits were the first GM-authorized totally integrated performance upgrade packages for TPI-equipped cars which substantially improved performance without sacrificing fuel economy, drivability, and emissions legality. These kits were warranteed through GM by SLP Engineering. Engine power increased by 50 HP at 5500 RPM, long above the point where the stock LB9 and B2L stopped performing, and there were corresponding torque increase from 2800 up through 5500 RPM. Each part was also available seperately thorugh GM dealers. 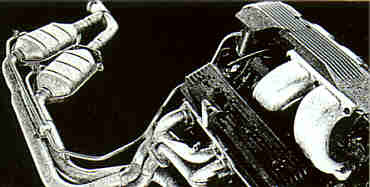 There was also an available SLP Cold Air Induction Package that was not part of the complete kit, but sold seperately.